Brisk colors are extremely popular this season. The bright pink cotton dress by CHLOE follows the trend. It attracts by an elegant broderie anglaise lace on the top. The back is decorated with poppers along the whole item for easier wearing. Baby bibs by Fendi have become very popular among young parents. This set of two bibs consists of cotton white bib embroidered with pink trims, and pale pink bib with a logo pattern. This item is essential in the daily life of each baby girl. Moschino Baby represents for young parents and their babies a nice bright pink cotton T-shirt. It is embroidered with a print of stone age necklace around the collar. The top has nicely capped sleeves. Two buttons on the shoulder is a big advantage for easy dressing. If you are looking for a nice and lovely sun hat for your baby girl, Aletta baby will help. This delicate white sun hat will attract the view. It has pretty frilled brim and thin strap to tie the hat under the chain. Pink roses and green bows add chic to the item and make it look really festive. 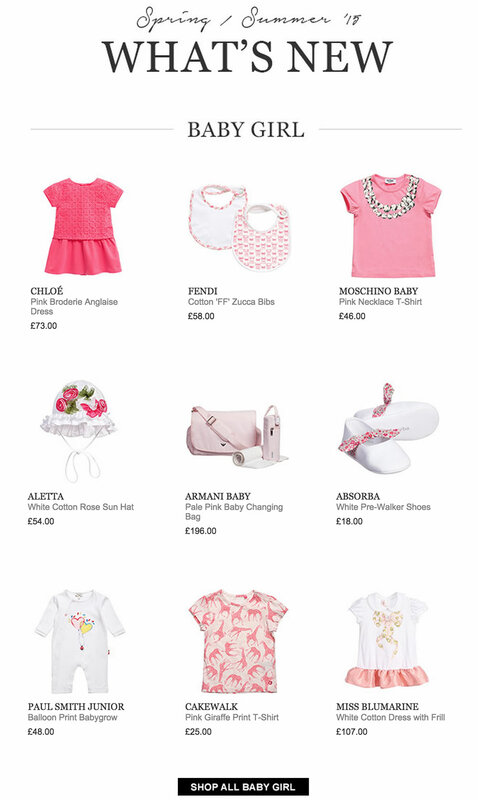 Armani Baby offers a big changeable bag of pale pink color for young mothers. It is a very useful item for carrying all essential things of a baby. The bag is practical, as it comes with a soft toweling and padded changeable mat. Pre-walkers shoes must provide the girl with comfort all the time. Absorba works on creating the best shoes for newborns. Look at these lovely white pre-walkers with a nice strap of floral print across the shoe. Every baby girl would for sure like wearing them. A nice baby grow would be the right choice for dressing little girls during summer time. This one by Paul Smith Junior doesn’t have feet. It is of white color with a funny image of a ladybird with heart balloon of yellow and red colors. The baby grow has poppers along all length for comfortable dressing. It will be good additional clothing in a wardrobe of a girl. Animal prints are very popular during summer time. Cakewalk offers to its young fans and their parents this cute T-shirt of pale pink color. The giraffe print attracts the view for sure. Girls love wearing dresses when the weather is warm. Miss Blumarine represents a lovely dress with frilled skirt of pale pink color. It has a smart collar and capped short sleeves. An image of a bow on the front of the dress seems gentle.